Through our fundraising arm of Talkingink, we have been building custom stores for people to sell their spirit wear and logo merchandise. It makes sense naturally that we would also include the fulfillment of printing shirts for organizations raising money and awareness through 5k races. If you have ever participated in these events then you need typically your registration fee includes a custom t-shirt created for that race. Kirkwood Trading Company has been screen printing in St. Louis for over 20 years. In that time we have printed t-shirts for numerous 5k race shirts. Everything from the major national foundations to the smaller local race events. With competitive pricing and quick turn around we have made strives in the bulk order screen printing community because we engage the client to find out there needs, and then make it very easy to fulfill those needs with little of their time. 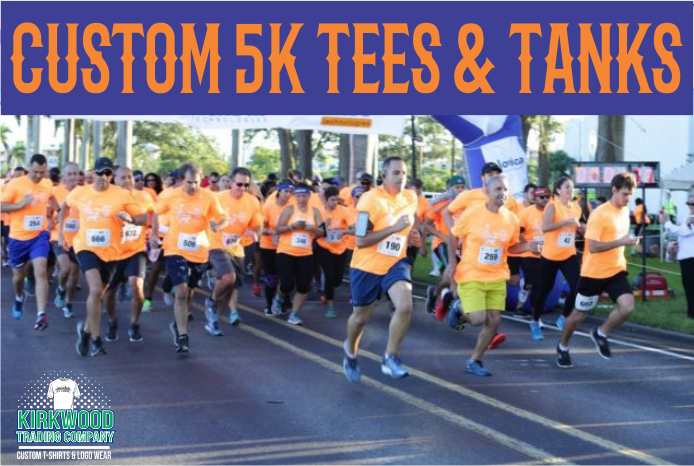 5K race shirts are a great item to present the participants because if done correctly, the race will have hundreds or thousands of walking billboards for their event. Since the cost should be built into registration fees, there is no cost to the foundation or organization. In addition to screen printing custom 5k race shirts, we also assist in custom t-shirt design. While many organizations have a graphic artist design their shirt each year, others don’t. They need a professional service to create a great design that people love to wear. Kirkwood Trading Company can help in the design of the shirt and depending on the quantity needed, often times this comes at no additional cost. We love designing and seeing the collaboration of your ideas and ours come to life in the form of a 5k race shirt. If you are hosting a 5k race and need to have tees and tanks printed, contact us and we’ll be happy to price your shirts as well as give you options on different materials and styles.